Search.email-dhp.com is the PUP that uses misleading techniques to prevent removal. Use Reimage to locate malicious components and get rid of them faster than with uninstall instructions. A full system scan blocks virus reappearance and prevents traffic to malicious domains. Why should you keep away from the Search.email-dhp.com virus? How can you keep browser hijackers away from your computer? What is the best way to remove Search.email-dhp.com from the infected device? Recently, the SaferBrowser struck again with yet another browser hijacker called the Search.email-dhp.com virus. This virus pretends to be a legitimate search engine and like the rest of the programs belonging to the SaferBrowser family, is designed to perform two main functions: stealthily hijack computers and generate sponsored advertisements. Of course, the virus creators do that with a specific purpose. They aim to have the users click on these ads and bring extra traffic to the websites they are promoting and, consequently, collect the advertising revenue. You might be thinking why don’t the users simply switch to a more reliable search engine instead of using Email-dhp. The problem is – they can’t. The virus makes sure that it is not that easy to get rid of and may install some extra software, such as toolbars, browser extensions just to help it stay in the system. Frankly speaking, the users are forced to waste their time digging through the irrelevant ads and sponsored links just to find the necessary information. However, there is no guarantee that the legitimate results are even included in the list. Thus, Search.email-dhp.com removal is necessary to be able to browse again regularly. Reimage is a reliable tool you can use for this purpose. 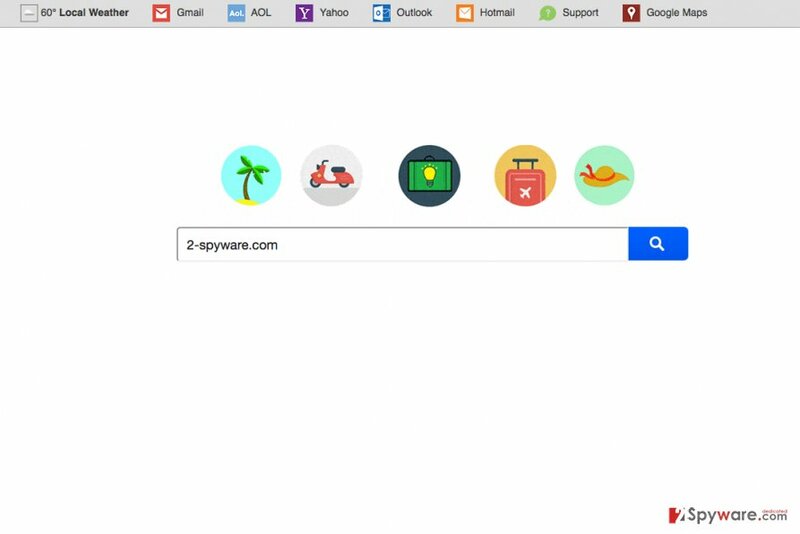 Google Chrome, Mozilla Firefox, Edge and Internet Explorer browsers can all suddenly start displaying Search.email-dhp.com instead of your regular search engine or homepage. Due to this hijack, i.e. constant redirect issue and generating of ads, the browser may start operating much slower, become unresponsive or crash. The additional use of the computer’s resources to carry out the mentioned processes may also impact the overall system’s performance, making your computer’s performance slower and followed by errors. Having all the inconveniences this virus imposes on the system users often think that its not up to their abilities to remove search.email-dhp.com without professional help. It is not true. You can eliminate this virus from your computer yourself, and you will find tips how to do it at the end of this article. There are numerous automatic virus-fighting utilities that are offering to provide protection against viruses. We must remind you that no matter how professional they might be, none of them can be fully trusted. Creators of potentially unwanted programs always find a way to sneak their questionable creations into the users computers. One of the most frequent way they do it is software bundling. They attach potentially unwanted programs to other free software so that when the users install a legitimate software, a potentially unwanted contents would install along. You can avoid it rather easily. The software’s setup offers several functions for installing the software. You can choose between “Quick” and “Advanced” settings. To be able to have more control over what you are actually installing on your PC, you should always choose the latter mode and closely follow the rest of the steps. A way to get rid of the unwanted application that you may have accidentally allowed on your computer is to scan the infected device with reputable antivirus scanner and let the automatic virus defending utility to do the rest. After the scan is completed, you will be sure that your computer is now virus-free, and you can proceed to use it safely again. Another alternative to the Search.email-dhp.com removal is manual elimination. This process requires attention to details and closely following professional instructions. Luckily, a detailed tutorial is provided just below the article. Here, look for Search.email-dhp.com or any other recently installed suspicious programs. Wait until you see Applications folder and look for Search.email-dhp.com or any other suspicious programs on it. Now right click on every of such entries and select Move to Trash. When in the new window, check Delete personal settings and select Reset again to complete Search.email-dhp.com removal. Once these steps are finished, Search.email-dhp.com should be removed from your Microsoft Edge browser. Here, select Search.email-dhp.com and other questionable plugins. Click Remove to delete these entries. Now you will see Reset Firefox to its default state message with Reset Firefox button. Click this button for several times and complete Search.email-dhp.com removal. Here, select Search.email-dhp.com and other malicious plugins and select trash icon to delete these entries. Click Reset to confirm this action and complete Search.email-dhp.com removal. Here, select Extensions and look for Search.email-dhp.com or other suspicious entries. Click on the Uninstall button to get rid each of them. Here, look at the Homepage field. If it was altered by Search.email-dhp.com, remove unwanted link and enter the one that you want to use for your searches. Remember to include the "http://" before typing in the address of the page. Now you will see a detailed dialog window filled with reset options. All of those options are usually checked, but you can specify which of them you want to reset. Click the Reset button to complete Search.email-dhp.com removal process. This entry was posted on 2016-07-19 at 00:28 and is filed under Stealing programs, Viruses. You can quickly scan the QR code with your mobile device and have Search.email-dhp.com virus manual removal instructions right in your pocket. How did you remove Search.email-dhp.com virus?